Some leaders of Nigeria Labour Congress yesterday got more than what they bargained for as they were heavily resisted by some angry Nigerians at the Terminus main market area of Jos city yesterday when they tried to mobilise traders to embark on a strike action scheduled for today, Daily Trus Newspaper says. An eyewitness account according to Daily Trust said; the labour union had arrived the market area in an 18-seater bus and a Jeep and began to announce to traders through a loudspeaker not to open their shops today but were told off by the traders. 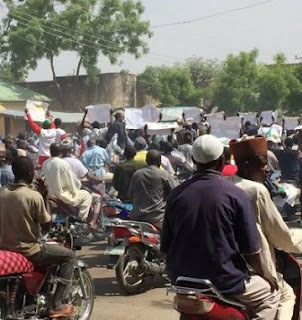 Auwal Mohammed, a vendor in the area, told our correspondent that some youths had surrounded the union members and began to chant in Hausa, ‘Karya kukeyi,’ meaning, ‘You are liars,’ accusing the unionists of being sell-outs and pelting them. However, the State NLC Chairman, Jibril Banchir, later sent a text message, saying the news of attack on his members at the Terminus area was not true. Meanwhile, feeler from the Federal Capital Territory, FCT Abuja suggests Judicial workers at the Federal High Court Abuja were seen this morning going about their normal duties defying the strike ordered by Nigeria Labour Congress, NLC. A renown human rights activist, a constitutional lawyer, now Senior Special Assistant to President Muhammadu Buhari on prosecution at the Ministry of Justice, Barr. Okoi Obono-Obla confirmed that the judicial workers at Federal High Court, Abuja were this morning seen going about their normal duties. The lawyer who posted on his facebook page this morning saying; "Right now I am before Honourable Justice A.F.A Ademola of the Federal High Court , Abuja in respect of the case of Federal Republic of Nigeria versus Col. Mohammed Sambo Dasuki (rtd) in Charge No. FHC/ABJ/CR/319/2015." "Abuja this morning is peaceful and quiet! Everybody is going about his or her business . Civil servants and workers have determinedly and unequivocally shunned the strike !" Obono-Obla stated. Also a renown journalist with the Premium Times, Mr. Nicholas Ibekwe also envisaged that the current strike action called by the Nigeria Labour Congress could fail. Nicholas, a fearless investigative Journalist who is envisaging the failure of the strike based on what he described as "credibility lost" of the labour union during the 2012 Fuel hike protest, which he said was influenced and hijacked by some politicians. He said; "I hope someone is compiling data and other details on how apolitical activism was gradually but surely killed between 2012 and 2015.?" "Today's protest and the strike would likely fail. Labour has a false sense of its base. Sadly, this will embolden this bumbling government. Nigeria's compromised organised labour lost its credibility during the 2012 protests. It created room for politicians to hijack the protests." "Genuine activists scared of being mocked for openly supporting the opposition in 2012, now merely show apathy toward the failings of this government. Many of them are kicking themselves for allowing political jobbers and mercenaries set the tone of the 2012 protests, as it has now become clear." "As a result, these impostors, who were doing the bidding of their paymasters, became influencers on social media and other places. We see them everyday, cooking up spurious excuses for these failings of this government. Their vile knows no limit. Now their stock in trade is to lampoon voices of dissent." "One day we shall wake up with deep regrets for this generation of young Nigerians who prefer to defend power rather than speak truth to it", Nicholas posted on his facebook timeline this morning.